+ Iceland (introducing the UK-sign family). 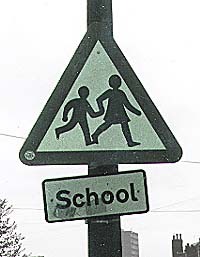 The British children's roadsign appears without apparent variation throughout the country. Very disappointing were it not for the Elderly people sign. It shows the children fifty years later. They are still feeling the need to cross the street. Observe the fact that the woman now pushes the man on the road. It asks probably less energy than the dragging of her youth. Two female persons would be more in accordance with vital statistics though. Collector's delight. With the old warning triangle fitted ! This find cries out loud and clear how impoverished modern roadsign design has become. It's already obvious between the British kind, and we really don't want to make a comparison with the preposterous match-stick designs of other countries (I will nevertheless mention one: e.g. Kyrgyzstan). The detail in the drawing is exceptional : real-world children to the fingernails. 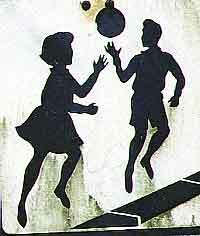 It's even better than on the much celebrated Danish children's sign. There is something peculiar though : The boy is wearing gauntlets. Why not the girl? Isn't she supposed to touch the ball? Did the boy took them away from her? Who shall say? This road sign forms a group with similarly drawn finds from Mauritius and Trinidad & Tobago. Notice the triangle, the general features and the individual border stones.